One of the most significant advancements in modern medical technology, robotic surgery has enabled surgeons to perform a host of common procedures in a less invasive manner than ever before. Whether used for urologic procedures, hysterectomies or gynecologic cancer surgeries, the flexibility and pinpoint accuracy of robotics result in less scarring, less blood loss and much faster recovery for the patient. Watson Clinic gynecologic oncologist Richard J. Cardosi, MD, was the first physician in Polk County to successfully complete a hysterectomy procedure utilizing robotics, and is consistently among the most experienced robotic surgeons in the state and among the top 20 nationally for gynecologic cancer surgery. He also offers a single-site robotic hysterectomy that has virtually a scarless single 1-inch incision, quicker recovery to return to normal activities, less pain and shorter hospital stay, and lower complication rates. He treats both complex benign gynecologic conditions and gynecologic malignancies with the new technology for approximately 70-80% of his total surgical procedures. 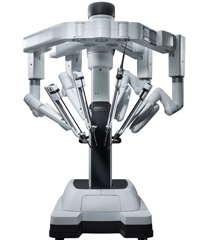 During the robotic hysterectomy procedure, a robot with mechanical arms is positioned by the patient’s bedside. Surgical tools are attached to the arms and inserted through very small incisions in a woman’s abdomen. The surgeon remains in complete control of the procedure every step of the way, directing the robotic arms with specialized hand controls while sitting at a console from which he views the operating field in 3-D with high definition optics. In 2006, Watson Clinic urologists became the first physicians in Florida to perform robot-assisted laparoscopic radical cystoprostatectomies (bladder removal surgery). In addition to these procedures, they continue to utilize robotics for a host of additional surgeries, including prostatectomies (partial or complete removal of the prostate gland) and partial nephrectomies (removal of part of kidney). Watson Clinic surgeons have long been leaders in utilizing advanced robotics in the specialties of cardiothoracic surgery, gynecologic oncology and urology. Meanwhile, Watson Clinic obstetrician-gynecologists Samantha Curtis, MD, Tarek Garas, MD, J. Brian Hopper, MD, Donald W. Langley, DO, Megan B. Luciano, MD, and A. Nicole Sparks, MD perform a variety of gynecologic procedures using the robotic method, including those aimed at treating reproductive issues, pelvic floor dysfunction, hysterectomies and uterine fibroids (benign, non-cancerous growths). General surgeon Dr. Thomas Moskal is the first specialist in Lakeland to perform gallbladder removal procedures utilizing only a single 1-inch incision. Performed with robotic surgery technologies, the procedure inspires a shorter hospital stay, a significantly faster recovery time, and a virtually scar-free result. These Watson Clinic physicians perform their surgical procedures using the da Vinci Xi® equipment at Lakeland Regional Medical Center. For more information on these procedures, or to refer a patient to one of these specialists, call 863-680-7486 for general surgery, 863-680-7578 for gynecologic oncology, 863-680-7243 for obstetrics-gynecology and 863-680-7300 for urology.